PULLMAN, Wash. – Recent news reports have focused public attention on the alarming threat of antibiotic-resistant bacterial infections in U.S. hospitals. But the threat is truly global. Antimicrobial resistance (AMR) is a focus of research at the Paul. G. Allen School for Global Animal Health at Washington State University, and was the topic of discussion at the WSU Innovators lecture series in Seattle on April 18. 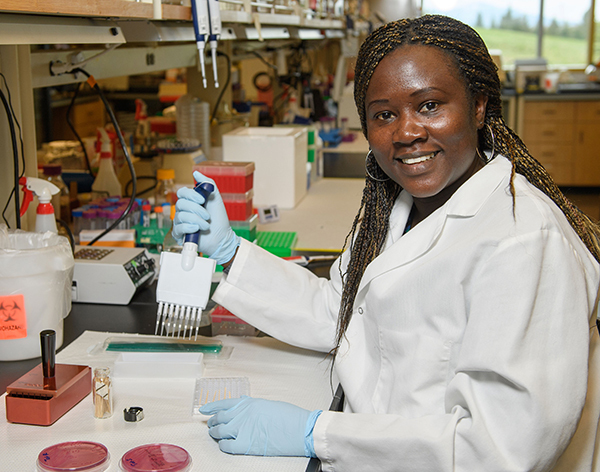 “The Innovators event highlighted how WSU’s research in Africa impacts health in the U.S.,” said Sylvia Omulo, a WSU doctoral graduate (participating in commencement in May) and a Innovators panelist. Antimicrobial resistance is favored whenever antibiotics are used, but unregulated use and unsanitary living conditions contribute disproportionately to this problem. Curbing the resistance challenge requires a global team of experts. 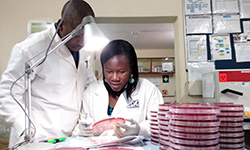 Scientists at WSU are working with global health agencies in East Africa to understand the emergence and spread of AMR and to develop solutions. Omulo earned her bachelor’s degree in biomedical science and technology from Egerton University in Kenya, and her master’s degree at the University of Leeds in the United Kingdom. While working with the Kenya Medical Research Institute/Centers for Disease Control and Prevention (KEMRI/CDC) program, she met WSU’s Paul G. Allen School for Global Animal Health scientists Guy Palmer and Terry McElwain, who were in Kenya to roll out a population-based animal syndromic surveillance project. In August 2011, Omulo visited WSU for the first time while attending a quality management systems training by the USDA and WSU. At that time, she was transitioning to a new position within the KEMRI/CDC program after earning her master’s degree. Omulo has been researching AMR for her doctoral dissertation, focusing on risk factors and control policies for AMR-driven infectious diseases within crowded urban communities in East Africa. Her dissertation research investigated the contributions of sanitation, environment, and antibiotic use in the spread of antibiotic-resistant bacteria. She found that when the environment is saturated with antibiotic-resistant bacteria, it is hard to understand the contributions of various factors, including the role of antibiotics. After her graduation ceremony in May, Omulo will continue her AMR research in Kenya as a WSU post-doctoral fellow. Her research as a post doc will advance the work of the Paul G. Allen School for Global Animal Health and help solve the critical problems facing the world, including antibiotic-resistant bacteria and infectious diseases. She feels well prepared now to understand community priorities and to develop and design interventions to improve health in her home country. In 2016, Omulo received the Epidemiology and Population Health Summer Institute at Columbia scholarship, and the Association for Faculty Women’s Karen DePauw Leadership Award. She is glad she chose WSU for her Ph.D. program. Omulo is not only a scientist, but a talented artist as well. She won national awards in Kenya for her art, some of which paid her undergraduate tuition. To become part of WSU’s team of scientists, visit gradschool.wsu.edu to find a graduate program that fits your talents and interests.